Combining sophisticated sound with simple operation, the VE-2 Vocal Harmonist delivers a complete effects solution for all singers, particularly those that perform with guitar. This portable, battery-powered stompbox has everything you need to create polished, studio-quality sounds everywhere you sing, from concert stages and street performances to practicing and having fun at home. 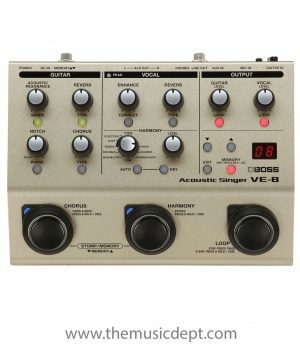 The VE-2 magically creates beautiful harmonised vocals that follow your singing, with pitch that automatically tracks the chords played on a connected guitar, a preset key, or a combination of the two. Using one of these three operation modes, it’s easy to create perfect real-time harmonies in any key, even if you have no experience with gear or music theory. In addition to harmony, the VE-2 provides essential effects to enhance your voice, such as high-quality reverb/delay and an enhancer with real-time pitch correction. Also included is a USB audio function that allows you to connect to your computer and easily capture impressive VE-2 vocal sounds for music recordings, social media videos, and more. Be the first to review “VE2 – Vocal Harmonist Pedal” Click here to cancel reply.